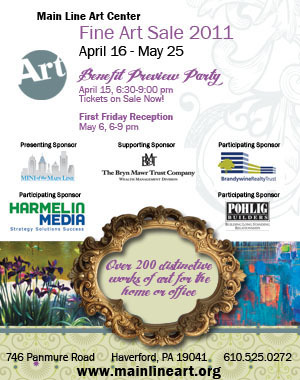 Pohlig Builders and The Athertyn Team at Haverford Reserve are proud sponsors of the Fine Art Sale 2011 brought to you by the Main Line Art Center. The Main Line Art Center’s Fine Art Sale is the perfect opportunity for both collectors and those new to art buying to purchase professional, unique works of art at affordable prices, in a comfortable environment. Each year they fill the gallery with original works of art in a variety of mediums, including oils, pastels, watercolors and sculpture, by professional artists from the region. Open to the public April 16 through May 25th or attend the First Friday Reception on Friday, May 6 from 6-9 pm.